stabilized earth design that the engineer originally envisioned had been used. “Precast concrete elements significantly reduced the construction time by eliminating shoring, eliminating concrete-curing time, and reducing the delays associated with working within the active railroad corridor,” says Jeremy Kirkpatrick of SRK Engineering, who designed this award-winning project. 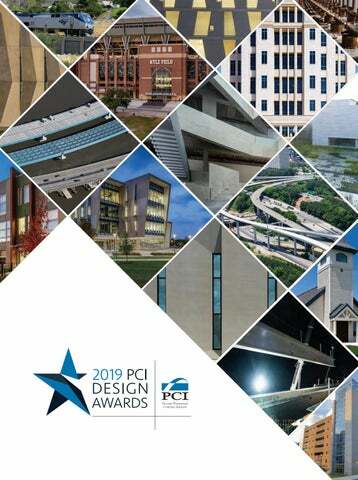 While proving that precast concrete is a superior option to other material choices, this year’s winners have also delivered an eclectic range of projects that showcase the durability, artistry, and cost savings that can be achieved with precast concrete. From a conventional apartment building in an evolving Chicago, Ill., community, to a three-mile-long bridge that provides both art and function for commuters crossing the Hudson River near New York, N.Y., to a massive football stadium designed with feedback from thousands of Texas A&M University sports fans, all of the winners took their precast concrete designs in new directions to meet the needs of their customers and the community. A jury of nine experts from across the design and construction industries helped us choose this year’s winners, which include 10 buildings, four bridges, and three special awards, along with several honorable mentions. The following pages showcase all of the projects selected by our judges. The honors were presented to representatives of each project during the 2019 PCI Convention at The Precast Show February 26 to March 2, 2019, in Louisville, Ky.
JURY John Circenis principal, Gensler, Los Angeles, Calif. John Circenis is an architect and principal in the Los Angeles, Calif., office of the global design and architecture firm Gensler. He has more than 30 years of experience in architectural design and implementation. As the Southwest regional design realization leader, Circenis has a unique talent for coordinating complicated building systems for large, complex projects such as airports and tall buildings. He served as a technical director on the Shanghai Tower, which is the world’s second tallest building. Circenis’s other notable projects include the Westin DEN Hotel and Transit Center, the Las Vegas Monorail, and the Ritz-Carlton Hotel at LA Live. Circenis is an active member of American Institute of Architects (AIA), serving on the Committee for Building Performance and Regulations. He has a bachelor of science in architecture degree from the Ohio State University. vice president and co-owner, FDG, Arvada, Colo. Monty Overstreet is vice president and co-owner of FDG, which specializes in the planning and conceptual design of precast concrete structures and provides design, detailing, and project management services. Overstreet has 28 years of experience in precast, prestressed concrete construction and has been a major contributor to some of the largest precast concrete construction projects throughout the United States. Over the past 19 years, he has worked on several high-profile projects, including the Maricopa County Courthouse in Phoenix, Ariz., and the Burns & McDonnell Corporate Campus parking structure in Kansas City, Mo. Most recently, he managed the precast concrete design for the $1.5 billion PennFIRST Patient Pavilion in Philadelphia, Pa., which is slated to open in 2021. Overstreet earned a bachelor’s degree in architectural engineering technology from the University of Southern Mississippi and is a member of both PCI and the University of Southern Mississippi Alumni Association. Michael Koch AIA, associate vice president, HGA, Minneapolis, Minn. As an architectural designer with Hammel, Green and Abrahamson (HGA), a multidisciplinary design firm headquartered in Minneapolis, Minn., Michael Koch combines his design skills and technical knowledge to creatively resolve unique design challenges. Koch’s background in architecture and landscape architecture allows him to work collaboratively with the HGA team to communicate design information through drawings, models, and other presentation media. He is motivated by the creative potential of architecture as he pursues design solutions from the broad perspective to subtle details. Key Project Attributes ❚ Repeatable custom formliners and a creative positioning of patterns create a random natural design in the façade. ❚ The project received Parksmart Gold certification from Green Building Certification Inc.
Project and Precast Concrete Scope ❚ Design and construct a six-story, 1750-stall parking structure. ❚ The project included 6089 pieces, using approximately 9074 yd3 of concrete. ❚ Construction was completed in under 11 months. PARKING STRUCTURE 5– CALIFORNIA STATE UNIVERSITY SACRAMENTO SACRAMENTO, CALIF. The goal of achieving sustainability was part of every decision made in the design and construction of Parking Structure 5 at California State University in Sacramento. Because the six-level structure with 1750 stalls sits at the very front of the campus, adjacent to its arboretum, the designers wanted to be sure that the structure would complement the natural setting, while also providing students and faculty with a durable, environmentally sound structure. The university also set a goal to achieve a Gold Parksmart rating, which is the highest rating offered by the Green Building Certification Inc. for the U.S. Green Building Council. The university “wanted it [the new project] to be the highest-performing, most sustainable parking structure west of the Mississippi,” says Farad Ibrahim, director of building systems innovation for the project’s contractor, Clark Pacific. The use of precast concrete helped make that happen. From the use of repeatable custom formliners and locally produced concrete to the naturalistic aesthetics, this project is a celebration of environmental design and construction, Ibrahim says. FOUR PROJECTS, ONE CAMPUS At the time that Parking Structure 5 was constructed, it was one of four projects being built on campus, and some of the others were on the sites of existing parking lots, which increased the need for the new parking structure. For these reasons, construction speed and minimal disruption of campus activity were priorities. The off-site manufacturing of the precast concrete elements eliminated the need for laydown areas on-site. Using precast concrete also eliminated approximately 5700 worker-days from the project and shortened the schedule from an anticipated 18 to 24 months to 11 months. The precast concrete project “went much faster than conventional construction, significantly reducing the impact of construction on the campus,” Ibrahim says. To minimize the project’s environmental footprint, the designers chose a precast concrete plant located just 27 miles from the jobsite. This plant derives more than 50% of its energy from its own colocated solar array, thereby reducing the environmental impact of manufacturing and transportation. “We eliminated waste and improved efficiency through the local manufacturing process, which also reduced cost and freed money for other enhancements,” Ibrahim says. These enhancements included 51 charging stations for electric cars, with infrastructure for 43 additional future spots, as well as adjacent integrated storage for 50 bicycles and 20 skateboards. The structure is also designed to receive a future photovoltaic canopy at the roof to offset energy usage. The project used a high-performing precast concrete hybrid moment frame (PHMF) to provide enhanced resilience during a seismic event. The PHMF also allowed for an open structure that is shear wall–free, thereby greatly enhancing passive security. “This is especially important in a student campus setting,” Ibrahim notes. OWNER: Photos: Kyle Jeffers Photography. California State University Sacramento, Calif.
PCI-CERTIFIED PRECAST CONCRETE PRODUCER AND GENERAL CONTRACTOR: Clark Pacific, West Sacramento, Calif.
Buehler & Buehler Structural Engineers, Sacramento, Calif.
HARRY H. EDWARDS INDUSTRY ADVANCEMENT AWARD Key Project Attributes ❚ Of the 23,000 panels, roughly 1400 had unique markings, which meant the project required detailed tracking. ❚ Each exterior block was placed on its own shoring during shipping, with layers of shoring attached between blocks to prevent sliding. ❚ The most-needed blocks were loaded in sequence to streamline erection. Project and Precast Concrete Scope ❚ Design and construction of a 240,000-ft2 museum expansion, including a new 204,000-ft2 gallery. ❚ The project included 28,782 interior architectural and structural walls and 23,212 interlocking pieces. ❚ Each 6-ft2 block was set individually, and erection crews averaged about 20 pieces per day. GLENSTONE MUSEUM “THE PAVILIONS” POTOMAC, MD. In 2014, the Glenstone Museum embarked on a major expansion project, adding a 204,000 ft2-building to its already spacious campus. The designers wanted materials of the new structure to evoke a direct connection with the surrounding landscape, while providing a lasting structure that reflects the modern art within the museum, says Travis Fox, vice president of operations for Gate Precast. “Precast concrete block was chosen for its durability and the natural variations and beauty exhibited in each specific panel.” The new structure appears to emerge from the hilly landscape and features a ring of gallery rooms surrounding a large, central water court. The exterior of each room is made of stacked blocks of precast concrete, individually placed to measure 6 ft long, 1 ft high, and 1 ft deep. No color-altering pigment was used in the design, Fox notes. Instead, the placement method and mixture of cement and sand were chosen to produce slight variations in the light-gray color and texture, creating a beautiful, naturalistic design. This finish deliberately contrasts with the smooth precision of the windows, which have been specially engineered using glass panels that are set flush into stainless-steel mullions. PCI-CERTIFIED PRECAST CONCRETE PRODUCER AND PRECAST CONCRETE SPECIALTY ENGINEER: Gate Precast Company, Oxford, N.C.
Skidmore, Owings & Merrill, Chicago, Ill. Photos: Gate Precast Company and Iwan Baan. markings, which required considerable coordination in detailing, production, tracking, delivery, and installation. The result is a beautiful, modern structure that is a unique example of the function and attractiveness of precast concrete. “Aesthetics were the primary objective of the architect as it related to precast concrete because the owners wanted to build something lasting and of enduring value,” Cruze says. Through careful coordination and planning, this precast concrete design fit the bill. ALL–PRECAST CONCRETE SOLUTION AWARD Key Project Attributes ❚ Off-site fabrication compressed the on-site construction schedule, minimizing disruptions and avoiding weather delays. ❚ The all-precast concrete design contributes physical resiliency to the structure, while visually communicating a sense of permanence and security to the public. ❚ The envelope features energysaving precast concrete sandwich wall panels with a 2½-in.-thick layer of expanded-polystyrene foam to ensure a continuous insulation R-value of 12. Project and Precast Concrete Scope ❚ Design and build a 30,500-ft2, three-story police precinct for Nassau County. ❚ The project included 236 pieces of precast concrete, totaling 28,670 ft2. ❚ Precast concrete erection was completed in two months. NASSAU COUNTY POLICE 8TH PRECINCT BETHPAGE, N.Y. In 2012, Hurricane Sandy inflicted more than $70 billion of damage to homes, roads, businesses, and public buildings across the Northeast. Over six years later, the region is still rebuilding from that natural disaster. Following the storm, many structures owned by Nassau County in New York were evaluated for structural damage, including the police precincts. Prior to the storm, several of these buildings had already been in need of renovations to accommodate a growing police force and resolve problems of aging infrastructure, and the storm accelerated this need, says Gilbert Balog of LiRo Architects + Planners. In the 8th District, Nassau County wanted to replace the 1950s-era frame and brick precinct buildings with structures that communicated civic pride and could withstand the onslaughts of future storms. “Resiliency was a major factor in the selection of precast concrete construction,” says Dianne Pohlsander, design architect for LiRo. “In fact, everything came together with precast concrete: resiliency, fabrication that wasn’t weather-dependent, constructability, and the desired aesthetics.” This project was the third in a series that LiRo designed for Nassau County police. The designs had to embody a consistent visual relationship that linked them to each other as well as the existing public infrastructure. “We wanted to bring the precinct into the 21st century, but also use some of the visual traditions of the county’s other public buildings, to express permanence and dignity,” Pohlsander explains. Precast concrete provided the flexibility to meet the precinct’s budget and durability goals while creating a cohesive architectural message. Precast concrete also helped address unique logistical challenges on this project. Construction was constrained by a long and narrow site, and, because the new precinct house was constructed at one end while the old building stayed open for operations at the other, the team was under pressure to complete the project quickly and with minimal site disruption. “Precast concrete gave us that quick erection time that we needed,” Pohlsander says. PCI-CERTIFIED PRECAST CONCRETE PRODUCER: High Concrete Group, Denver, Pa.
LiRo Engineers Inc., Syosset, N.Y.
Jacobs Engineering Group, Dallas, Tex. As a senior projects architect and firm wide resource on codes and life safety, Marty Huie is often put in the position of challenging established concepts and synthesizing complicated and sometimes conflicting requirements from clients and the construction trade industry. He works closely with his clients to navigate the regulatory requirements for healthcare facilities, communicate the impact of those requirements on facility designs, and generate innovative design solutions. When he’s not designing structures, Huie educates clients and the design community through one-on-one and association presentations, as well as by writing for recognized industry publications. Huie has served as a National Fire Protection Association (NFPA) Healthcare Subcommittee member since 2004, and he has actively debated code issues on the floor at the NFPA national committee meeting. He has a bachelor of architecture degree from Louisiana Tech University. project engineer, EnCon Design, Denver, Colo. Roksana Taghizadeh is a professional structural engineer who specializes in precast/prestressed concrete design. In her 10 years of industry experience, she has primarily focused on providing design consultant services, and she has acted as the lead project engineer on numerous residential, commercial, and industrial projects. Taghizadeh has been involved with PCI for most of her career, and she participates on several committees. She has completed the Leadership PCI (LPCI) program and is currently chair of the Industry Diversity Committee. She holds a bachelor’s degree in civil engineering from the University of Colorado–Denver, with an emphasis on structural engineering and a minor in German. Engineers Group, Mt. Prospect, ILL. Chris Mosley is a licensed professional engineer and president of The Consulting Engineers Group Inc. (an Illinois corporation). He specializes in the design of precast concrete superstructures of various types. Mosley is currently a member of PCI’s Technical Activities Council, as well as the Building Code and BIM Committees, and is the incoming Professional Member director of PCI’s Board of Directors. He has also served as the chair of the Building Code committee and was a member of the eighth edition Industry Handbook Committee. Mosley has a bachelor’s degree in civil engineering from Tulane University, and a master’s degree in civil engineering from Purdue University. Key Project Attributes ❚ Each panel was a true structural member cast 12 in. thick with 100% mixture. ❚ The longest spans were nearly 45 ft. in length, with nearly all pieces angularly cut to fit the structure. ❚ Precasting allowed for precisely prefabricated load-bearing walls whose finish could be closely controlled. Project and Precast Concrete Scope ❚ Design and construction of a three-story art school building with two additional floors of below-ground parking. ❚ The project included 188 unique hollow-core panels, ranging in thickness from 8 to 16 in. ❚ Off-site precasting meant each floor could be erected in less than one week. MUSEUM OF FINE ARTS, HOUSTON–GLASSELL SCHOOL OF ART HOUSTON, TEX. The new Glassell School of Art building in Houston, Tex., is itself a work of art. The defining geometry, sloping plane, and elegant use of light and space all come together in a structure that will be an anchor for the Houston community. Much of the design was made possible through the use of precast concrete, says Olaf Schmidt of Steven Holl Architects. “The precast concrete structural elements hold up the floors and define the exterior, incorporating the angle of the main incline.” The precast concrete façade design alludes to the adjacent sculpture garden walls created by Isamu Noguchi, a noted artist and landscape architect. “The simple planar structural pieces of the sandblasted precast concrete plane give character to the inner spaces of the building in the spirit of simplicity and directness,” Schmidt says. FLEXIBILITY AND CONTROL From a structural perspective, the main challenge on the project was to ensure continuity between the different types of structural components. The building’s geometry is characterized by individual panels that rotate, twist, and incline to varying degrees at random locations, requiring detailed attention to the load path. “The precast concrete walls allowed for precisely prefabricated load-bearing walls whose finish could be closely controlled and was therefore consistent for the entire building,” Schmidt says. The use of precast concrete also allowed for the minimization of wall thickness in some key locations and provided control over placement of the reinforcing steel. Connections between precast concrete panels; cast-in-place, mild steel-reinforced concrete, hollow-core slabs; and post-tensioned concrete are located throughout the structure. “Ensuring that forces transfer properly from one component to another was critical for the structure as a whole,” Schmidt explains. Precast hollow-core concrete planks frame the floor systems and span between the cast-in-place concrete perimeter beams. “These made a relatively lightweight, long-span floor framing system possible—up to 40-ft-long spans with a depth of only 16 in.—and were surprisingly flexible, allowing for embedded systems and field-installed penetrations,” Schmidt says. The wall panels vary in size and geometry and are spaced along the perimeters so full-height, glazed panels could be installed between adjacent precast concrete panels. This structure of alternating concrete panels and large, translucent panels exposes the internal art studios to diffuse natural light while achieving a distinct external design that draws in passersby. “The precision of the precast concrete panel design allowed for the simultaneous fabrication of the glass windows based on drawings rather than field measurements” Schmidt notes. The panels all touch each other due to the placement of the glass; therefore, once set, each panel had to be braced and set with a “ring beam” on top. Schmidt emphasizes that the flexibility and performance of precast concrete made the design possible. “Precast concrete for the exterior structure provided a superior finish and consistency over cast-in-place concrete,” he states. Museum of Fine Arts, Houston, Tex. PCI-CERTIFIED PRECAST CONCRETE PRODUCERS: Gate Precast Company, Hillsboro, Ala. Gate Precast Company, Pearland, Tex. Stehler Structural Engineering, St. Paul, Minn. Aykut Cetin, PE, Scottsdale, Ariz.
Steven Holl Architects, New York, N.Y. Guy Nordenson and Associates, New York, N.Y.
Cardno Structural Engineering, Houston, Tex. McCarthy Building Companies, Houston, Tex. Precast Erectors, Inc., Hurst, Tex. PROJECT SIZE: 93,000 ft2 Photos: Kendall/Heaton Associates and Photography at Richard Barnes/2018. Key Project Attributes ❚ Architectural precast concrete panels are resistant to moisture. ❚ The continuous, low-permeability insulation creates a moisture barrier to prevent vapor diffusion and air infiltration. ❚ Multiple mock-ups were produced to ensure that the veining technique would deliver the limestone appearance the architects desired. Project and Precast Concrete Scope ❚ Design and construction of a nine-story tower for a pediatric healthcare facility. ❚ The project included 75,953 ft2 of architectural precast concrete composed of 667 individual panels. ❚ Due to massive existing profiles, panel thickness ranged from 4 to 19 in. COOK CHILDREN’S MEDICAL CENTER –SOUTH TOWER FORT WORTH, TEX. In 2014, Cook Children’s Medical Center in Fort Worth, Tex., broke ground on a nine-story addition for the largest pediatric healthcare provider in the Dallas-Fort Worth, Tex., metropolitan area. Building healthcare facilities always comes with a unique set of challenges, says Sean Patrick Nohelty, principal with David M. Schwarz Architects. These buildings must be designed to address the varied needs of patients and staff while meeting the highest standards for air quality, temperature and moisture control, and exterior aesthetics. The strict performance criteria and desire to create a lasting and beautifully designed solution for the community’s most vulnerable patients drew the designers to precast concrete. Precast concrete was selected over a typical masonry design or cast-in-place concrete on a steel frame through “Choosing by Advantages” (CBA), a system in which each factor in the material selection was weighted according to the structural needs of the project and compared to find the best specification. The CBA analysis determined that a precast concrete façade would deliver ideal waterproofing, insulation, and sound transmission, as well as sufficient ceiling space. The precast concrete elements also brought speed and durability to the project and helped keep costs low. All of this was achieved “while still meeting the medical center’s exacting standards for high quality,” Nohelty says. BRICK AND BLOCK—BUT BETTER In the preliminary stages of the project, Nohelty contracted Gate Precast Company to serve as a design-assist consultant for the exterior façade. That collaboration led to a more efficient design that addressed issues early in the process. For example, Gate’s team worked with the insulation manufacturer to conduct a series of thermal and moisture analyses to ensure long-term thermal resistance and eliminate concerns of condensation and mildew. The early involvement of Gate’s team also allowed team members to assist in design development and detailing. They met weekly, using building information modeling (BIM) tools to revise the plans in real time. “This was our first foray into using BIM in a fully integrated way where all consultants were participating,” Nohelty says. The resulting design features a hand-set brick and natural limestone façade that matches the architecture of the existing campus. To avoid an overly uniform design, false joints and color variation were incorporated into the precast concrete panels, providing a more authentic brick-and-limestone appearance. By using precast concrete for the design, the project team avoided the site congestion that is typical when limestone, cast stone, and brick are used in the field. The insulated architectural exterior system saves more than 35% in annual BTUs when compared to a brick-and-block assembly, while providing an environment that is comfortable, quiet, and moisture resistant. The cohesive aesthetic of the precast concrete panels and the affordable construction contribute to the continued success of the hospital and opportunities for growth in the future. Cook Childrenâ&#x20AC;&#x2122;s Medical Center, Fort Worth, Tex. PCI-CERTIFIED PRECAST CONCRETE PRODUCER: Gate Precast Company, Hillsboro, Ala.
CallisonRTKL, Dallas, Tex. ; David M. Schwarz Architects, Washington, D.C. Photos: Gate Precast Company and Steve Hall of Hall + Merrick. BEST HIGHER EDUCATION/UNIVERSITY BUILDING Key Project Attributes ❚ Extremely angled fin panels are polished to look like metal “gills.” ❚ All panels were placed monolithically, which allowed the glazing to fit each section. ❚ The precast concrete design has a thinner profile and stronger hurricane resistance than a metal panel system would have. Project and Precast Concrete Scope ❚ Create a precast concrete façade that simulates metal designs with a wind-resistant material. ❚ The precast concrete skin features 2-in.-thick, highly polished precast concrete panels. ❚ Three-piece windows fit within a highly complex design featuring six precast concrete pieces. FIU STUDENT ACADEMIC CENTER MIAMI, FLA.
A DELICATE LOOK PLUS HURRICANE RESISTANCE The student center has a unique appearance, which, like a chameleon, changes as the light changes. This design was not originally created with precast concrete in mind. The designer began with a metal panel concept, but converted their plan to use architectural precast concrete to achieve cost and durability benefits. However, he wanted to keep the metallic look originally envisioned. The precaster achieved this aesthetic effect through the use of polished precast concrete panels with a thin profile. Coordination meetings were held between the contractor, design team, and precaster throughout the project, and three-dimensional models were used to perfect the design. The façade features polished panels with extremely angled fins and mirrored glazing between for the auditorium and the main building with spandrels over the connecting areas. The finned panels had to be perfectly coordinated to support highly complex window openings, which feature three pieces of glass and six precast concrete pieces. The window openings, which are intended to look like gills, are central to the building’s distinctive appearance and emphasize the internal use of palm fronds to diffuse light in the environment. After conducting shade studies, Zaudke was able to create a design that draws natural light into the building, which limits the buildup of native heat and helps to keep ambient temperatures cool. All panels were placed monolithically, which allowed the precaster to rotate the panels without damage while leaving room for the glazing to fit within the narrow sections. Despite the complex design, the façade was highly modularized, greatly simplifying construction and installation, Zaudke says. “Rather than stick-framing each of the undulations, the façade was hung in a series of panels.” The result is an almost exotic structure, which sits at the entrance to this global university and welcomes students from around the world. Florida International Universityâ&#x20AC;&#x201C;Modesto Maidique Campus, Miami, Fla.
Gate Precast Company, Kissimmee, Fla.
Walter P Moore & Associates, Tampa, Fla. Photos: Rich Montalbano/RiMO Photo, LLC and Gate Precast Company. BEST MULTI-FAMILY BUILDING AND ALL-PRECAST CONCRETE SOLUTION AWARD HONORABLE MENTION Key Project Attributes ❚ Precast concrete panels were cast over the winter and erected in the spring, accelerating construction. ❚ The use of precast concrete helped the buildings earn Energy Star and Enterprise Green Communities certifications. ❚ Highly insulated walls, windows, and roofs deliver energy efficiency, noise reduction, and a durable, low-maintenance design. Project and Precast Concrete Scope ❚ Design and construction of 13 three-story apartment buildings with 72 units. ❚ The all–precast concrete design included insulated exterior walls panels, interior bearing/demising walls, floors, and roofs. ❚ Precast concrete construction was completed in five months. NELSON MANDELA APARTMENTS CHICAGO, ILL.
Landon Bone Baker Architects has worked on several housing projects with Bickerdike Redevelopment Corporation in the West Humboldt Park neighborhood of Chicago, Ill. Over time, these architects have come to understand the design approach that best meets the needs of the community and the client’s budget. “We are trying to create a substantial presence in the neighborhood by building out vacant lots,” says Hope Dinsmore, senior project architect. The most recent project in this series was the Nelson Mandela apartments: 72 residential units in 13 three-story buildings on eight previously vacant, city-owned lots and five privately owned parcels. The combination of three- and six-unit structures is part of a scattered-site, infill, affordable housing development. “Precast concrete was suggested early on by the general contractor,” Dinsmore says. Whereas past projects used precast concrete exterior walls and stick-built floors and interior bearing, the team went with a 100% precast concrete design for this project. “We’ve used precast concrete on other projects in the neighborhood, and we liked the speed of erection, especially with the high cost of labor in the city,” Dinsmore says. Easy upkeep, durability, and improved sound performance were added benefits. Bickerdike Redevelopment Corporation, Chicago, Ill.
PCI-CERTIFIED PRECAST CONCRETE PRODUCER: Dukane Precast, Naperville, Ill.
Landon Bone Baker Architects, Chicago, Ill. MECHANICAL, ELECTRICAL, AND PLUMBING ENGINEER: Elara Engineering, Hillside, Ill.
Eriksson Engineering Associates, Chicago, Ill.
Key Project Attributes ❚ Modular 3-ft-wide panels wrap the exterior of the building. ❚ The pronounced diamond pattern connects to the Sporting Kansas City’s established branding. ❚ “Rock striations” in the panel design tie to the local geography. Project and Precast Concrete Scope ❚ Create a custom precast concrete façade for a new training facility. ❚ The project included 156 pieces of noninsulated architectural precast concrete cladding. ❚ The panels are 7.5 to 9.5 in. thick, plus the projection. PINNACLE NATIONAL DEVELOPMENT CENTER KANSAS CITY, KANS. Pinnacle National Development Center represents a groundbreaking collaboration between a professional sports team, a national sports federation, and a first-class sports medicine provider. The new, 81,000 ft2 training center for the professional soccer club Sporting Kansas City also provides a permanent facility for training U.S. Soccer coaches and referees, and is home to the Children’s Mercy Sports Medicine Center, which provides a full range of sports medicine services, resources, and programming for student athletes in all sports. The project was intended to provide training for athletes from across the United States while conveying a distinctive sense of place that would invite each visitor to feel like a part of the local environment, says Dirk McClure, director of business development for Enterprise Precast Concrete. The sand-colored precast concrete façade with three-dimensional patterning helped to make that happen. “Through the use of modular, repetitive formliners, the custom design pattern makes a statement, and this one-of-a-kind design solely belongs to the new home of this team,” McClure says. READY FOR THE NATIONAL STAGE Precast concrete was not the initial choice for this project, McClure notes. When they designed the building, the architects wanted use depth, color, and textural variation to express “the movement of the body and the ball,” he says. The design team explored multiple exterior-cladding options, such as fiber-reinforced concrete or fiber-cement panels. But after multiple design iterations and cost estimates for these options, team members determined that they needed another option to stay within budget. “Solid architectural precast concrete panels were the next logical step,” says McClure. The primary design element is the pronounced diamond pattern cast into the precast concrete wall panels. The look was chosen after an extensive mock-up process, in which the precast concrete team filmed a panel for a full day to learn how sun and shadows affected the protrusions in the precast concrete panel design. “Everyone loved it,” McClure says. An acid-etched finish was also used in the entryway of the building for a modern design sensibility, and a sandblasted finish at the field level integrates the design with the landscape. A rain-screen system featuring a wood veneer was added as further complement to the precast concrete panels. Along with delivering the desired visual effect, the use of precast concrete helped the project stay on schedule and budget. As winter approached, “precast concrete contributed to a fast-track delivery method with quick erection times,” McClure explains. Also, precast concrete “offered a cost-effective exterior design solution,” he says. The versatility of precast concrete helped to meet the client’s ultimate goal of creating a unique building whose design feels local to the area but can also stand out on the national stage. “With a client as passionate and involved as the design team was, this facility successfully came to life as a world-class training facility and exceeded all expectations,” McClure says. PCI-CERTIFIED PRECAST CONCRETE PRODUCER AND PRECAST CONCRETE SPECIALTY ENGINEER: Enterprise Precast Concrete, Omaha, Neb. Photos: Jacia Phillips Photography and Enterprise Precast Concrete. BEST ALL–PRECAST CONCRETE PARKING STRUCTURE Key Project Attributes ❚ Thin–brick elements were cut and cast into precast concrete pieces to mimic other architecture on campus. ❚ The spandrels are supported on the exterior face of the perimeter columns, with brick-clad column covers provided above and below the spandrels. ❚ An access road was constructed to accommodate the delivery of precast concrete to the site, and it has since become a part of the campus ring road system. Project and Precast Concrete Scope ❚ Design and construct an all–precast concrete seven-story parking structure. ❚ The project included 329 pieces of architectural precast concrete and 1028 pieces of structural precast concrete. ❚ Erection was completed in three and a half months. UNIVERSITY OF MISSISSIPPI NORTH PARKING STRUCTURE UNIVERSITY, MISS. Limited space, a sloped project site, and a very tight schedule were just a few of the challenges that designers faced when building the new parking structure for the University of Mississippi. The seven-story structure sits in the heart of a campus built in the 19th century, so the design had to be practical and durable without overwhelming the existing architectural fabric. The designers knew that an all–precast concrete solution would help them address all of these issues. “An all–precast concrete design simplified construction, reduced costs, and compressed the schedule versus options with traditional masonry or other applied façade material,” says Rob McConnell, vice president of parking solutions for Eley Guild Hardy Architects. It also helped the design team replicate the local architectural feel with a more modern and durable solution. PCI-CERTIFIED PRECAST CONCRETE PRODUCER: Gate Precast Company, Monroeville, Ala.
PRECAST CONCRETE SPECIALTY ENGINEER: Midwest Structure Engineering, West Allis, Wis.
Precast Erectors, Inc. Hurst, Tex. Photos: Carl Walker, a division of WGI. Key Project Attributes ❚ Precast concrete “clapboard” design delivers a durable structure with country charm. ❚ Thick plastic inserts were used in formliners to achieve and maintain the clapboard-like design throughout production. ❚ The structure was sealed with an antigraffiti coating for added protection. Project and Precast Concrete Scope ❚ Design and construction of a one-story chapel and spire. ❚ The precast concrete elements included 4310 ft2 of 8-in.-thick, solid load-bearing wall panels, and 924 ft2 of 8-in.-thick hollow-core slabs. ❚ Erection was completed in six days. ST. JOHN’S CHAPEL AND MAUSOLEUM COLUMBIA, S.D. Gage Brothers, Sioux Falls, S.D. Albertson Engineering, Rapid City, S.D. KyBurz Carlson Construction, Aberdeen, S.D. Key Project Attributes ❚ Precast concrete provided an effective structural and finishing material that allowed for a schedule- and cost-sensitive approach to construction. ❚ Subtle 3-in. faceting of the panels creates an interplay of light and shadow that adds a sense of depth to the façade with minimal investment. ❚ A two-hour precast concrete firewall separates portions of the building. Project and Precast Concrete Scope ❚ Design and construction a gym and pool buildings for a suburban high school. ❚ The gym project included 40 exterior faceted precast concrete panels and 12 single-story exterior ribbed precast concrete panels. ❚ The pool project used 15 exterior faceted precast concrete panels, 10 interior precast concrete firewall panels, and 8 precast concrete columns. ❚ The buildings were erected separately during the winter, and each erection was completed in less than one month. Continental Erectors, LLC LaSalle, Ill.
Key Project Attributes ❚ A massive, two-phased stadium redesign project was completed in 26 months without affecting game play at the stadium. ❚ More than 24,000 fans offered feedback that shaped the design and amenities in this $485 million project. ❚ When the stadium was completed in the fall of 2015, it represented the most extensive redevelopment of a collegiate athletic facility in history. Project and Precast Concrete Scope ❚ Completely redesign a college football stadium to accommodate 102,733 attendees. ❚ The project included 2450 flat slabs and 2487 architectural pieces. ❚ Construction was completed in 26 months, in time for the 2015 football season. COLLEGE STATION, TEX. The 2015 renovation of Texas A&M University’s Kyle Field was at that time the largest ever collegiate sports project in the United States. The $485 million, 26-month redevelopment project included completely rebuilding the college stadium in two phases to expand capacity to 102,733 seats, making the stadium one of the five largest in collegiate football. “Most large projects come with a series of challenges,” says Craig Kaufman, principal at Populous, the architect for the project. “For Kyle Field, budget and schedule were at the top of the list.” Populous and Manhattan-Vaughn JV (the construction team) were challenged to find creative ways to reduce cost and risk over the project’s 26-month timeline, which covered two active football seasons. According to project requirements, the renovation was not allowed to affect the team’s ability to play games in the stadium, which meant site congestion and traffic had to be kept at a minimum. Enterprise Precast Concrete, Corsicana, Tex. Heldenfels Enterprises, Inc., San Marcos, Tex. ENGINEER OF RECORD: Walter P Moore, Houston, Tex. PCI-CERTIFIED ERECTOR: Precast Services, Twinsburg, Ohio Photos: Christy Radecic Photography. NU RYAN FIELDHOUSE & WALTER ATHLETICS CENTER PRECAST WAVE WALL EVANSTON, ILL.
Key Project Attributes ❚ The lake-facing precast concrete wall resembles a wave through a design that tapers and slopes in two planes simultaneously. ❚ A special connection using galvanized column shoes and epoxy-coated splice sleeves was developed for the project. ❚ Shoes were secured to the cast-in-place knee wall with anchor bolts, eliminating the need for bracing. Project and Precast Concrete Scope ❚ Design-build precast concrete coastal wall that can withstand waves and ice rubble on the shore of Lake Michigan. ❚ The project included 109 segments that were 5 ft wide and warranged in two planes to replicate the appearance of a wave. ❚ The splice sleeves are the main structural connection to withstand wave loads. Utility Concrete Products LLC, Morris, Ill.
PRECAST CONCRETE SPECIALTY ENGINEER: Larson Engineering, Naperville, Ill. Photos: Utility Concrete Products, LLC. Federal Highway Administration, Washington, D.C. Reggie Holt is a senior bridge engineer and the concrete bridge specialist in the Federal Highway Administration (FHWA) office of Bridges and Structures at FHWA Headquarters in Washington DC. In this position, he is responsible for national policy and guidance on bridge design and analysis. Holt has a bachelor of Science and masters of science degree in Civil Engineering from the University of Maryland. Holt is a registered professional engineer and member of multiple technical committees including: ex-officio for the AASHTO T-10 Committee on Concrete Design, PTI Post-Tensioned Bridge Committee, PTI grouting committee, PTI Cable Stay Bridge Committee and the PTI/ASBI grouted post-tensioning committee. In addition, Holt has participated on multiple NCHRP technical review panels and has been appointed to multiple Blue Ribbon Panels and Expert Task Groups throughout his career. State bridge engineer, Georgia Department of Transportation, Atlanta, Ga. Bill Duvall has more than 25 years of experience in bridge design, maintenance, and inspection. He is currently the state bridge engineer for the Georgia Department of Transportation and was previously an assistant state bridge engineer and a state bridge inspection engineer. He is also a member of the American Association of State Highway and Transportation Officials Committee on Bridges and Structures. Duvall has a masterâ&#x20AC;&#x2122;s degree in civil engineering from Georgia Tech and is a licensed professional engineer in Georgia. JP Binard owner, Precast Systems Engineering, Exmore, Va. JP Binard has owned and managed Precast Systems Engineering (PSE) since July 2016. His team provides engineering services relating to precast and prestressed concrete or ultra-high-performance concrete (UHPC) components for the bridge, building, and marine industries. Some of his most notable current projects include precast concrete consulting on the Western Railyard Platform for Hudson Yards and serving as construction engineer for the LaGuardia Frontage Road project. Prior to his tenure with PSE, Binard was chief engineer for Bayshore Concrete Products. Binard has served on many PCI committees, including his current roles as chair of the UHPC Subcommittee to the Committee on Bridges; chair of the Prestressed, Precast Concrete Pile Committee; and member of the Committee on Bridges, Lateral Stability Subcommittee. He received his bachelor of science degree in civil engineering from the University of Nevada. BEST BRIDGE WITH A MAIN SPAN FROM 76 TO 149 FT (23 TO 45 M) Key Project Attributes ❚ The project team sequenced construction to limit its environmental impact during breeding and migration periods for threatened and endangered species. ❚ Using precast concrete girders eliminated the need for routine maintenance to superstructure elements, thereby reducing the future impact of the bridge on the sensitive river channel. ❚ A 750-ton crane was used to set the girders in the center section of the three-span bridge to speed erection and keep the bridge open throughout construction. ❚ Rapid construction of a 416-ft-long bridge over a sensitive riverbed. ❚ The project included 42 precast concrete girders and 450 precast concrete partial-depth deck panels. ❚ Phase 1 construction was completed in 11 days, and phase 2 construction was completed in 18 days. ST. GEORGE, UTAH The Interstate 15 (I-15) Brigham Road Bridge replacement is one of many Utah Department of Transportation (UDOT) projects constructed with precast concrete, a material that brings so many benefits to these infrastructure investments. The design features precast concrete partial-depth deck panels to replace the formwork and half of the concrete and reinforcing bars. Historically, these project elements have been cast-in-place on the jobsite, but a cast-in-place design would not meet the project goals, says Spencer Stephenson, project engineer with Horrocks Engineers. UDOT and the design team developed an aggressive 11-month construction schedule that required construction be substantially completed before the winter season. “Choosing precast concrete shortened the construction duration so that the critical-path construction schedule elements could be met and the project completed on time,” Stephenson says. PROTECTING FLYCATCHERS The construction timeline was further complicated because the bridge is built over the Virgin River floodplain, which provides critical habitat for several threatened and endangered (T&E) species, including the southwestern willow flycatcher and the Virgin River chub. The construction teams had to be mindful of breeding seasons and minimize disruptions to the ecosystem of the delicate environment. “The biggest risk in meeting the tight timeline was getting critical bridge substructure elements installed within those environmental constraint windows, while also dealing with the flooding events from the Virgin River,” Stephenson says. To complete the project, the river had to be shifted from its original course so the drilled shaft foundations could be placed, and construction could not take place during summer months when the habitats were most vulnerable. The project team installed the substructures and columns prior to the restricted period and sequenced construction to avoid impacts during sensitive breeding and migration periods for the T&E species. To shorten the duration of disruption, the Horrocks team developed a strategy with the girder fabricators to complete the inside lanes of the new structure in the spring and the outside lanes in the fall. “The strategy was contingent on a quick start, with drilled shaft foundation installation for both phases of construction being the critical path,” explains Lee Cabell, project manager for Horrocks. The phasing and methodology used to complete the bridge structure efficiently allowed the team to work within the environmental constraints and keep two lanes of travel on mainline I-15 open at all times throughout the duration of the construction. This strategy reduced delays for motorists and ensured the safety of the traveling public by virtually eliminating back-up on I-15. Once construction was completed, the team restored and revegetated the floodplain habitat with willows and natural vegetation, and installed T&E-friendly voidless riprap for erosion protection during flood events. Going forward, the decision to use precast concrete will have lasting benefits, Stephenson notes. â&#x20AC;&#x153;Using precast concrete girders eliminates the need for routine maintenance to the superstructure elements,â&#x20AC;? he explains. These long-term benefits lower the overall cost of the project and will protect the sensitive river channel for decades to come. BEST BRIDGE WITH A MAIN SPAN MORE THAN 150 FT (46 M) Key Project Attributes ❚ The project was the first design-build-finance for the Georgia Department of Transportation. ❚ The use of precast concrete elements minimized traffic disruptions and the environmental impact on sensitive adjacent lands. ❚ A 182.4-ft-long precast concrete bulb-tee girder used on the project is the longest such girder used in Georgia. ❚ Create a managed-lane solution to relieve traffic congestion along a 29.7-mile-long corridor in Georgia. ❚ Project scope included 30 bridges constructed with precast concrete beams. ❚ Each precast concrete bent cap required one and a half hours to erect in the field, which allowed 12 to 16 precast concrete bulb-tee beams to be erected per week. NORTHWEST CORRIDOR EXPRESS LANES MARIETTA, GA. Photos: Parsons, Aerial Innovations of Georgia Inc., and Northwest Express Roadbuilders. PCI-CERTIFIED PRECAST CONCRETE PRODUCER AND PRECAST CONCRETE SPECIALTY ENGINEER: Standard Concrete Products, Atlanta, Ga.
BEST NON-HIGHWAY BRIDGE Key Project Attributes ❚ Use of a precast concrete design accelerated construction, getting a delayed project back on track. ❚ Controlled concrete mixtures provided high strength and high corrosion resistance. ❚ Some walls were built using post-tensioned concrete to increase their strength and allow a two-piece counterfort with horizontal and vertical components. ❚ Build 7900 ft of precast concrete retaining walls to support light rail. ❚ The project delivered precast concrete to create 86,000 ft2 of retaining wall. ❚ The wall height reaches 23 ft in some places. MID-COAST CORRIDOR RETAINING WALLS SAN DIEGO, CALIF. If you have spent time in San Diego, Calif., chances are you have seen the 2019 non-highway bridge award winner. The new Mid-Coast Corridor Retaining Walls extend the light-rail infrastructure from the Old Town neighborhood of San Diego north to La Jolla, Calif., and provides a second heavy-rail track through the entire corridor. The walls were built along the railroad rightof-way to increase the width of the corridor and allow for three additional sets of railroad tracks to be constructed. The original design used soldier pile walls and mechanically stabilized earth to meet the project goals; however, the designers shifted to a precast concrete counterfort retention system when they recognized the many benefits that this solution would bring to the project, says Jeremy Kirkpatrick, precast concrete wall contractor with SRK Engineering. “Precast concrete elements significantly reduced the construction time by eliminating shoring, eliminating concrete-curing time, and reducing the delays associated with working within the active railroad corridor.” Monolithic counterforts were developed for the project, and one tier of counterforts could be used for walls up to 14 ft high. Standard prestressed hollow-core concrete panels, which are commonly used for parking structures and other buildings, were used for the wall panels. “The panels are lighter and stronger, and they can therefore span 15 ft or more between counterforts,” says Erick Aldrich, principal engineer with SRK Engineering. Controlled concrete mixtures were used to create high-strength precast concrete with a high corrosion resistance. Some walls were built with post-tensioned concrete to increase their strength and allow a two-piece counterfort with horizontal and vertical components. San Diego Association of Governments, San Diego, Calif.
PCI-CERTIFIED PRECAST CONCRETE PRODUCER: Clark Pacific, Irwindale, Calif.
PRECAST CONCRETE SPECIALTY ENGINEER: Oldcastle Precast, San Diego, Calif. THE NEW NY BRIDGE PROJECT BEST TRANSPORTATION SPECIAL SOLUTION Key Project Attributes ❚ Four crossbeams, weighing nearly 3000 tons in total, were cast on a barge and shipped to the site for installation. ❚ The approach viaducts are composed of 19 five-span units, with each span stretching 350 ft from pier to pier. ❚ Permanent precast concrete tubs act as a form for waterline pile caps, reducing environmental disruption and in-water work. ❚ Design and build twin 3-mile-long bridges over the Hudson River. ❚ Project included 60 precast concrete pile caps, 59 precast concrete pier caps, and 6806 precast concrete deck panels. ❚ One of the largest cranes in the United States set the heaviest sections into place. (GOVERNOR MARIO M. CUOMO BRIDGE) TARRYTOWN AND SOUTH NYACK, N.Y. Governor Cuomo of New York now has the privilege of having two 16,000-ft-long bridges named in his father’s honor. These two structures linking Tarrytown, N.Y., to South Nyack, N.Y., over the Hudson River will help streamline traffic while also adding an element of beauty to the river scene. “The bridge has been honored by the communities it serves by being recognized as a ‘Work of Art’ by the county art organization and council,” says Jamey Barbas, project director, New York State Thruway Authority. Constructing this river crossing was no small feat. The nearly $4 billion project was the largest construction project in the history of the New York State Thruway Authority, and one of the largest bridge projects in the nation. “The key challenge on the project was simply one of sheer size,” Barbas says. “The bridges cross over one of the widest points of the Hudson River, covering a distance of 3.1 miles.” Using precast concrete elements helped the designer tackle this challenge while keeping scalability in mind. “Applying the efficiencies of precasting was pivotal to delivering this mega-project,” she says. BARGING IN The project involves six linear miles of bridge composed of 85% approach viaducts and 15% cable-stayed structures. “The project used a vast amount of precast concrete materials, including pile caps, pier caps, road deck panels, and crossbeams between its eight iconic towers,” Barbas says. Almost all (95%) of the piers and their foundations are waterborne, which made construction difficult. To expedite construction and limit the amount of fabrication/casting performed over water, the designer developed precasting techniques to reduce on-site construction. The four 60- and 70-ft-long crossbeams, which weigh nearly 3000 tons in total, were cast on a floating barge in Chesapeake, Va., and transported by barge directly to the main span for installation. Instead of using sheet-pile cofferdams for pile caps, which would have been a labor-intensive method with an unacceptable environmental impact, the designers developed a permanent precast concrete tub system as a form for the waterline pile caps. The tubs, which weighed an estimated 360 tons each, were shipped by barge to the project site and lifted into place over previously driven piles. “This strategy yielded a huge benefit in terms of the schedule, reduced volume of in situ concrete placement, enhanced worker safety, and a reduction in the environmental risks otherwise associated with pile cap construction using cofferdams,” Barbas says. To manage the giant precast concrete elements, the project used one of the largest lifting cranes in the United States, and a 16-acre staging area at the Port of Coeymans in Albany County, N.Y. “The location of these staging yards alongside the Hudson River allowed the builder to readily barge the materials directly to the project site for installation with this large crane,” Barbas explains. The project met all of its goals and has resulted in a signature structure that will serve more than 50 million travelers annually for decades to come. Photos: New York State Thruway Authority. Bayshore Concrete Products, Cape Charles, Va.; Coastal Precast Systems, Chesapeake, Va.; Fort Miller Co. Inc., Schuylerville, N.Y.; Unistress, Pittsfield, Mass. Photo: High Concrete Group LLC and Tom Rossiter. OWNER: McGough Development, St. Paul, Minn.
PCI-CERTIFIED PRECAST CONCRETE PRODUCER: Gate Precast Company, Hillsboro, Tex. PCI-CERTIFIED PRECAST CONCRETE PRODUCER: Wells Concrete, Maple Grove, Minn.
PRECAST CONCRETE SPECIALTY ENGINEER: Stehler Structural Engineering, St. Paul, Minn. ARCHITECT: BWBR Architects, St. Paul, Minn. The 57th Annual PCI Design Awards will open for entries on May 20, 2019. Join us in our search for excellence and submit your projects electronically by August 19, 2019. Visit PCI.org for more information and submission details. Photo courtesy of USC/Gus Ruelas. 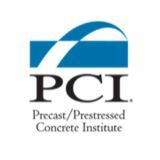 The Precast/Prestressed Concrete Instituteâ&#x20AC;&#x2122;s (PCI) certification is the industryâ&#x20AC;&#x2122;s most proven, comprehensive, trusted, and specified certification program. The PCI Plant Certification program is now accredited by the International Accreditation Service (IAS) which provides objective evidence that an organization operates at the highest level of ethical, legal, and technical standards. This accreditation demonstrates compliance to ISO/IEC 17021-1. 56th PCI design award winners are previewed in this supplement.